Familiar storylines continued in the July employment report for Kitsap County. Washington pot shops haven’t really needed to advertise yet. There’s so little recreational marijuana to go around that stores are struggling just to keep product in stock. Eventually though, there will be enough supply, and enough stores open, that pot shop owners will need to promote themselves to stand out in the crowd. There’s been some confusion around the rules that dictate pot advertising, so the Liquor Control Board posted a handy FAQ yesterday to clear the air. Advertising in print media (like newspapers!) is OK. Though printed publications are sometimes distributed to schools, but the LCB doesn’t intend to enforce the 1,000-foot buffer for newspaper advertising. Advertising on radio and TV stations is permitted but could conflict with federal regulation. Retailers can’t sell marijuana for less than cost and they can’t give away free samples. Retailers can advertise with decals on a vehicle or delivery truck, but that vehicle cannot enter any of the 1,000-foot buffer areas, which would make getting around town pretty tricky. 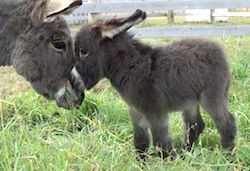 Q: I assume that I may choose a logo that is not directly related to marijuana, such as a donkey? A: Yes, but be careful that the logo does not appeal to children. Q: I want to provide free “mini doobies” to concert goers. However, the MJ I’m giving is not mine. It is medical marijuana that is of the same strain as those I will sell in my recreational retail store. I’ve announced this on my I-502-licensed Facebook page and website. Is this ok? A: Not ok. As a licensed business, you may not give away marijuana. You may only sell taxed and tested marijuana that you purchased from a processor. Q: May you use wording implying just how fine your brand might be. Like, “County Gold, Washington’s Best,” or jingles? You can read the full FAQ here. The Washington Health Benefit Exchange is gearing up for its sophomore season, with open enrollment starting Nov. 15. You can see a statewide breakdown of carriers and plans here. Moda Health is the only new carrier for Kitsap this year. In addition to five individual plans, Moda will be the only carrier offering small business plans in Kitsap. BridgeSpan is affiliated with Regence BlueShield. Regence dropped Harrison Medical Center from its provider networks following a contract standoff this summer. That means Harrison facilities and Harrison HealthPartners physicians aren’t in-network for Bridgespan, and Bridgespan customers will pay more out-of-pocket for Harrison services. BridgeSpan is the only carrier offering Platinum (lowest copay) plans in Kitsap. About 5,000 Kitsap residents signed up for coverage through the state exchange this year, while 13,000 were covered by Medicaid for the first time. For more information on the exchange, visit the Insurance Commissioner and Healthplanfinder websites. South Kitsap Industrial Area is now Puget Sound Industrial Center – Bremerton. After much discussion, the Port of Bremerton commission approved the name change with a resolution Tuesday evening. That followed the approval from the Bremerton City Council last week. Local government leaders were looking to widen the appeal of the industrial center, which they hope will attract companies and jobs to the region. “As we reach out to have industrial and manufacturing come to this beautiful area, we need to have a broader recognition,” Bremerton Mayor Patty Lent said Tuesday. “It’s catchy,” Commissioner Larry Stokes said. The port is inquiring about renaming the SKIA connector road. 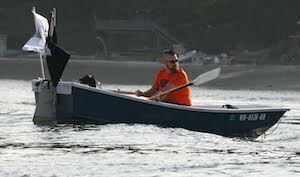 When I last saw Dave Lambert Sunday morning he was rowing vigorously off into Puget Sound. I chased Lambert and his rowboat through Agate Passage in my kayak and snapped some photos before pulling out in Suquamish. Lambert, it turned out, had another five hours to go. He covered the 14 miles across Puget Sound and through the Ballard Locks in about 6 hours and 45 minutes, according to an email he sent Monday. The Slippery Pig Brewery owner was inspired to deliver the keg of beer by rowboat after learning about early residents of the county and the long distances they rowed on a regular basis. Lambert’s journey to Seattle reinforced his admiration for those sturdy souls. A developer hopes to build a new bank and coffee shop buildings off Highway 305 in Poulsbo. The 2,500-square-foot bank building and 1,700-square foot coffee shop/retail space would be constructed on vacant property sandwiched between 7th Avenue and the highway, just south of Forest Rock Lane and north of Union Bank. Both the bank and coffee shop would have drive thru windows, according to a conceptual plan posted on the city website (and embedded below). No specific tenants were mentioned. A pre-application conference for the project, titled RPI Retail, will be held at 1 p.m. Sept. 16 at Poulsbo City Hall. Comments can be submitted at the meeting or to kboughton@cityofpoulsbo.com. Click her for full details. PacLand of West Seattle is the applicant for the project. There was a lot of anger in the wake of the Thursday announcement that a contract between Harrison Medical Center and Regence BlueShield would terminate, and much of it was directed toward the local hospital. Harrison sent a notice Friday to its patients covered by Regence with a letter from interim Harrison President Joe Kortum. (Longtime CEO Scott Bosch retired last month). In the letter, Kortum expressed disappointment in the outcome of the negotiations and apologized to patients for the disruption. The letter also lists insurance still accepted by Harrison, with a suggestion that Regence customers to talk to their employers about switching carriers during the next enrollment period. South Kitsap Industrial Area, better known as SKIA, will soon have a new name. Port of Bremerton commissioners will vote next week to rebrand the area as Puget Sound Industrial Center – Bremerton. The Bremerton City Council passed a similar resolution this week. While PSIC–B doesn’t roll off the tongue quite as nicely as SKIA, port and city officials believe the inclusion of Puget Sound will make the name more recognizable to potential business tenants. It is perceived that adding “Puget Sound” increases the ability of clients outside this area to more easily identify with this area, and “Bremerton” pinpoints the exact location of the City which it falls in. The words “Industrial Center” highlights the fact that we are one of only eight Manufacturing/Industrial Centers (MIC) designated by Puget Sound Regional Council. SKIA, which includes Bremerton National Airport, Olympic View Industrial Park and a mix of port and private property, was designated as a regional Manufacturing/Industrial Center in 2003. Bremerton later annexed much of the land. Site work is underway in Silverdale for an expansive new shopping center. 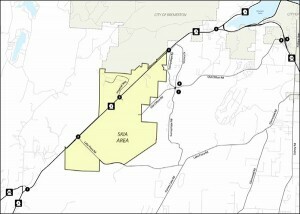 An official groundbreaking for The Trails at Silverdale is scheduled for Aug. 28. The development is located on 20 acres west of the Highway 3/303 junction, off Greaves Way and Clear Creek Road. Businesses will include a mix of retail stores and restaurants, including some “new-to-market tenants, and local offerings as well,” said Alec Paddock with development company CenterCal Properties. No specific tenants have been announced. The shopping center is expected to open in the fall of 2015. You can read our previous stories about The Trails at Silverdale project here and here. Our colleagues at the Kitsap Peninsula Business Journal also wrote extensively about the plans. This post was updated to include information from the developer. Which Kitsap businesses have bounced back? Retail sales in Kitsap County, and just about everywhere else, took a nose dive after 2007. E-commerce: While still a small industry in Kitsap (about 3 percent of all retail trade sales), e-commerce grew in bounds over the last seven years. Online sales more than doubled between 2007 and 2013.